These photos were taken by Jennifer Bartel during “The Art of Music in Milwaukee – Live Concert” featuring artists/musicians Amanda Schoofs, Hal Rammel and Paul Mitchell, who each had visual artwork in “The Art of Music of Milwaukee” exhibition (June 13 – July 12, 2014). Artists/musicians David Collins, Pat Reinholz, Steve Schlei, Trevor Saint and Warren Enstrom, accompanied and performed musical pieces that correlates to the visual artwork in display. 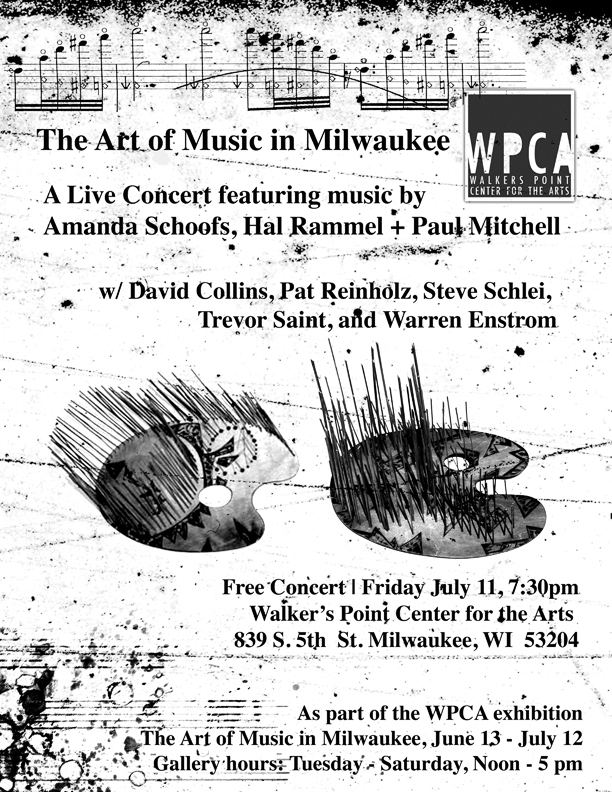 The concert was a collaboration between WPCA’s “The Art of Music in Milwaukee” exhibition and artists Amanda Schoofs, Hal Rammel and Paul Mitchell. Donate Magazines for Children’s Art Project!